This is delicious, nutritious, easy and freezable. Make your own cereal without the preservatives, extra sugar, and salt that comes with boxed store brand. Did I mention its cheaper? 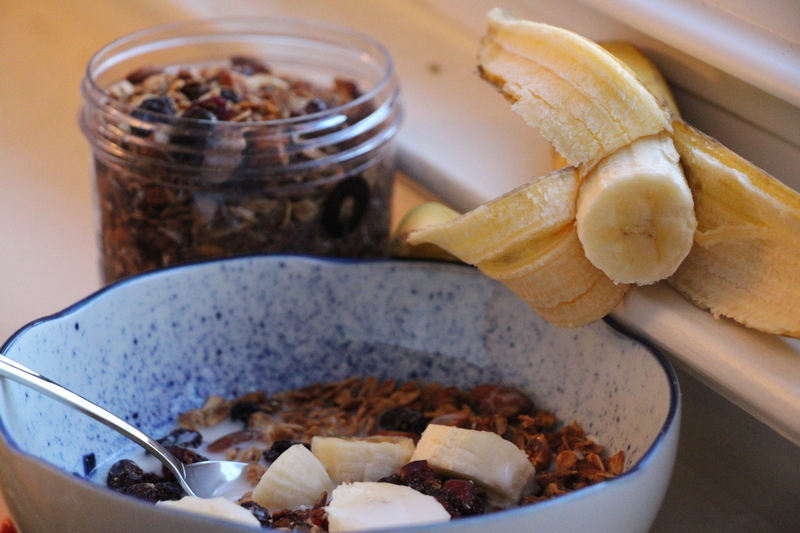 Ok, basically granola is toasted whole oats with fun stuff stuck to/on it. This recipe makes one large cake pan worth of granola. 5. Put all the wet ingredients in a small sauce pan, heat on LOW (burns quick), stirring occasionally, until everything is 100% liquid i.e. all the chunks are out of the coconut oil. Metal cookie sheets tend to cook/toast faster than glass cake pans and require more careful flipping, you also have to look out for loner oats that get burnt near the edges of the cookie sheet. Adding the spices and wets gradually ensures even spice distribution. Adding Chi’a seeds after the wets ensures you don’t just get a big chi’a deposit on the bottom of your bowl, the things are tiny so you have to mix them in with some stickiness. People differ in their granola preferences, some (like me) like it really toasted and crunchy, some like it softer and muesli-like. How long you bake it after the initial 30 minutes is going to determine your toastiness level. All sweetners are optional, except perhaps a certain level of maple syrup. Agave nectar works well in place of maple syrup, gives a …plant-y organic-y taste to it if you are into that. 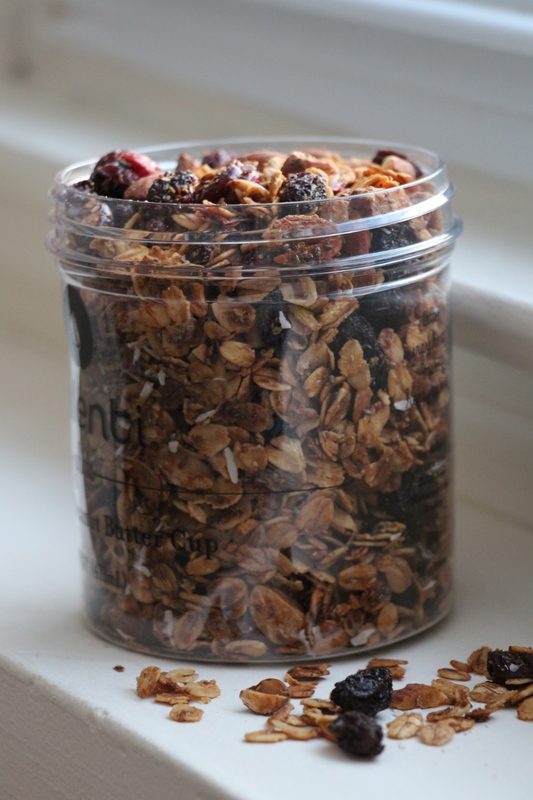 At its most basic level, the granola formula is oats, some kind of oil or fat, spices, sweetener, oven. You can add or subtract anything else according to your liking, you just have to determine if it gets baked or added in last. My general rule, anything raisin-like or dried fruits goes in post-bake, anything grain or nut gets baked. Doubling, tripling, and quadrupling the recipe works well, it can all go in the oven provided you have enough containers. 3 batches usually gets me through the week, but I tend to eat granola like its my job. Stuff keeps well just in a bag on the counter like ordinary cereal, but if you are worried you could refrigerate/freeze. Hi All! This will be a happy belated birthday post to me (-: My birthday being two Sundays ago, but this being the first time I have a moment to stop and write. 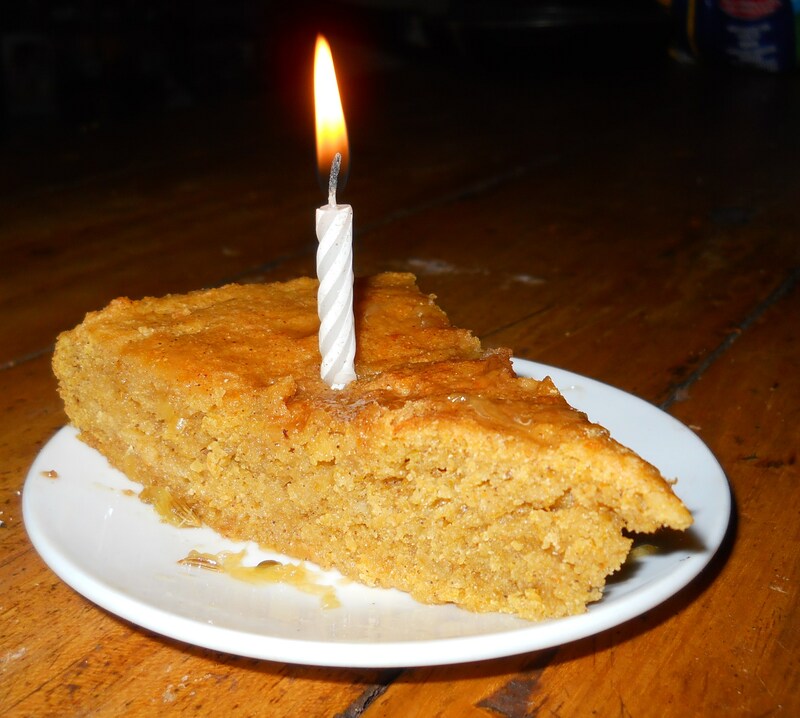 Because I am gluten-free and vegan, people always wonder how they should make me a birthday cake. This year, we decided to make Sticky Sweet Potato & Pumpkin Cake from the Anniversary Issue of VegNews (August 2010). This is my favorite cake at the moment, so I was happy to have the excuse to eat more of it. The picture here really doesn’t begin to do justice to this very incredibly fabulous cake. Since I cannot find a link to the original version online, I will type it up below. I made a few changes (made it gluten-free for one), and used the ingredients I had on hand instead of the exact ones called for. Non gluten-free people loved it! They said it was a bit dense, but still devoured it with pleasure. I did not notice a density issue – then again I’m pretty used to eating gluten-free foods so that might account for the difference of opinion. Best of all, this spicy cake taste amazing the next day with a fresh cup of chai (or coffee). I especially love this cake because it is so spicy that the sweetness is a bit masked and you can eat it for dessert, but it also makes a nice sweet but not too sweet breakfast. Preheat the oven to 350 degrees and grease a 9-inch cake pan. The original directions say you should also line it with parchment paper, I was able to flip it out later without doing this step. Also if you use silicone cake pans you shouldn’t have trouble flipping it out. But, if you are worried, also line the pan with parchment paper. Mix sweet potato, squash, oil, brown and white sugar, milk, vanilla, orange zest, and lime juice together until well blended. Separately mix the rest of the cake ingredients (except the raisins). Add the flour mixture to the wet mixture and stir until combined, do not over-mix Add in raisins (if you like that kind of thing) and pour into the cake pan. Bake for 35 minutes or until a toothpick inserted into the center of the cake comes out clean. In the meantime, combine all of the syrup ingredients and bring to a boil stirring frequently. After boiling for 2 minutes, reduce heat and simmer for another 10 to 15 minutes until the syrup is reduced by one-third. Remove from heat and cool. Strain the mixture and set it aside. Cool the cake for about 20 minutes. Then run a knife around the sides and carefully flip the cake out of the pan. Carefully flip the cake again, this time onto a serving dish. Poke some small holes in the top of the cake at one inch intervals. Then spoon warm syrup over the cake spreading it evenly over the cake. Be generous with the syrup and add more as it begins to soak in. Let the cake sit for an hour before serving and then serve with extra syrup. This year I am fortunate enough to have the opportunity through Peace Corps to work with Catholic Relief Services (CRS) as their Monitoring and Evaluation Coordinator in Kedougou, Senegal. I am currently helping them monitor their nutrition program, known as PRN. CRS works in many villages in the region of Kedougou to identify malnourished children and pregnant/nursing mothers. Then we follow-up with them by recommending they visit their closest health structure, teaching them how to make nutritious foods from local materials, tracking their progress, and enrolling them in our program to hand out USAID food if this is available in their village. Recently, I went to a seminar on how to make nutritional porridge and it gave me a whole new meaning to the idea of cooking from scratch. The porridge is fairly simple, and you could probably whip this up in under half an hour. Basically you combine bean (black-eyed pea) flour, peanut flour, rice flour, and sorghum or millet flour. Then you add sugar until it tastes okay and you have your porridge mix. Next you take a small amount and add hot water until it is the desired consistency. To me this kind of tastes like a cross between porridge and baby food, which I guess it is? Still, it is super nutritious so feel free to eat it or feed it to your loved ones. It could be a great weaning food. Also, it makes good portable camping food! True, it doesn’t taste amazing, but it tastes good enough and don’t we all need some more hearty easy vegan camping food? I think you can buy all of these flours at a natural foods store although you might need to make your own black eyed pea flour. I haven’t done this yet, but I think if you roasted the dry black eyed peas for about 20 minutes you could grind them up in a spice grinder or food processor and it would work just fine (check out this post on making mung bean flour). Unless you have a grain mill, and then can we be friends please? Oh yeah, did I mention that this village is on top of a mountain and has absolutely spectacular views? I love my job. Growing up my Dad always made us Aunt Jemima’s pancake mix pancakes for breakfast. For some reason in my head he was probably the only person who was capable of making pancakes. Yes, I could make them, but only under his supervision and only using this magical mix. After going gluten-free I tried eating some pancakes made from different mixes and they were good, but never knocked my socks off. Then Anne made me banana bread pancakes from My New Roots and I was stunned. I suddenly remembered my childhood and how magical pancakes really are. When I ran out of ingredients to make these pancakes I decided to take a stab at making some more traditional tasting ones. I stole this recipe as a base (it looks really good but I didn’t have all of those ingredients) and worked from there. I am happy to report these came out incredibly delicious and I simply can’t get enough of them! I like to make the batter and leave it in the fridge so I can have a pancake snack whenever my sugar levels are running low. I would like to add vanilla extract too but I don’t have any. If I did, I would try adding 1/4 tsp. Blend dry ingredients well. Mix wet ingredients together and add them to the dry ingredients. Heat up some oil and fry on both sides until golden brown. Serve with maple syrup, agave nectar, jam, or vegan yogurt. Make a pancake like hash brown (this one was 1 and 1/2 cups of shredded potatoes) and place it in a shallow bowl. Fill with steaming hot chili. Enjoy! Dosas might be one of my favorite meals. They are a crepe-like pancake made out of lentil flour and usually stuffed with a potato mixture. You can find them at Indian and Nepalese restaurants, and I highly recommend them. However, today I’m going to tell you about my new favorite power packed breakfast: the reverse dosa. Potato hash brown on the outside and lentils on the inside! Lentils, full of nutrients and protein, make an excellent complement to the hash brown ensuring your breakfast will not only wake you up, but keep you going all morning. To make the daahl, boil lentils in veggie stock until they are completely broken down and look like lentil mush and then salt and pepper to taste. I like to start with two cups of stock to one cup of lentils and then add water as needed. For example, if the water is starting to run out and lentils are in danger of sticking to the pan, but they don’t looked mushy yet, add more water. If the lentils are starting to look mushy, and you still have a lot of water left, you should take off the lid (if you have been using one) and boil off the water. Make sure to stir more often when you are doing this to keep the lentils from sticking. For brown lentils, this process takes a while – about an hour – and will require a lot of water. For red lentils it will be closer to 20 minutes, and will be closer to the 2 to 1 ratio of water to lentils. For this recipe I prefer brown lentils, and like to make a big batch once a week so all I need to do is heat them up in the mornings. Once you have your daahl, make one large hash brown pancake. Heat up the daahl and place inside the hash brown. Then fold over the hash brown. Enjoy! For the past two weeks I have had hash browns every single morning for breakfast. No, this is not an overstatement. In fact, I would say since I moved to Kedougou I eat hash browns for breakfast about 80% of the time. So, in honor of how much I eat these, I feel I owe you a few blog posts on this topic. To start us off, I bring to you today a guest post from Rachel Billings. She is the one who taught me how to make hash browns, so I figured it would be appropriate that she share her knowledge with you directly today. Spuds, taters, potatoes, starchy golden deliciousness, Hash browns! This simple breakfast food has a special place in my heart. As a kid my father taught me how to make hash browns. They were his favorite…. and probably the only thing he didn’t ever burn! When I got older I got interested in running races and triathlons, and my dad was my best training partner. After every race we competed in we always made hash browns. Coffee and hash browns: The best recovery meal in my opinion. Take as many potatoes that you want to eat (I have in one sitting eaten 2 pounds of hash browns….). Shred with a grater. If this is your first time, I recommend cooking 1 and 1/2 cups of hash at a time. Pour enough oil in a non-stick flat pan to cover the bottom well. You will need about 1/4 a cup of oil for 1 and 1/2 cups of hash. Wait for about 2 minutes to get the oil really hot. –a note: once you put the potatoes in the pan, do not stir them because this will cause them to stick. Just throw them in, flatten them out so they take up as much surface area as you have and then don’t move them. That is the key to not sticking your potatoes. Sprinkle with salt and pepper. Keep on med – high heat until the first flip (about 2-5 minutes). When the spuds are starting to turn brown on the edges and the middle is starting to dry out a bit if you can easily slip a spatula underneath now is the time to flip. Like a pancake, you want to try and get the whole thing in one flip, but if you mess up it’s no big deal just as long as all the potatoes get cooked. Once you do the first flip, turn the heat down to medium-low. This will ensure that the potatoes in the middle get cooked. Flip a second time when the spuds on the bottom are a golden brown (about 15 min for 1 and 1/2 cups of hash at med-low heat). Continue to cook until they taste done (looses that pure starch taste) and are golden brown and crunchy on the outside. You can flip to cook whichever areas aren’t yet golden brown, and you might want to turn the heat back up to help crisp up the outsides. If it starts to burn, turn down the heat and or add more oil. Salt and pepper to taste. Serve with ketchup or other breakfast things, or just coffee!